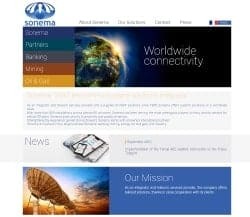 Sonema introduces its new website, a digital showcase of all our skills and expertise. Released to the public on January 19th, 2015, this new version was in the works for several months, in cooperation with Media Sense. This website has been designed to provide an easy access to all kinds of useful information. Updated graphics, new ergonomics, better layout: teh website was rebuilt to offer an easy and quick access to information. All documentation, product sheets and much more are now available 24/7, showcasing all of our line of work with carefully crafted texts and images. Enjoy your visit on our new website; discover our services, solutions, news and much more!